PerServ runs on your personal computer. PerServ is a re-conceptualization of server architecture. PerServ defaults to offering 7 dynamic http/https port pairs. The total port pair space is potentially in the 10's of thousands. PerServ embeds a numeric system-assigned password into each url. 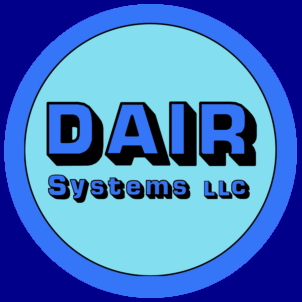 Anyone who possesses the url (contains port and password) has access. For PerServ native applications, this improves security or ease of use. PerServ offers it services via port pairs. 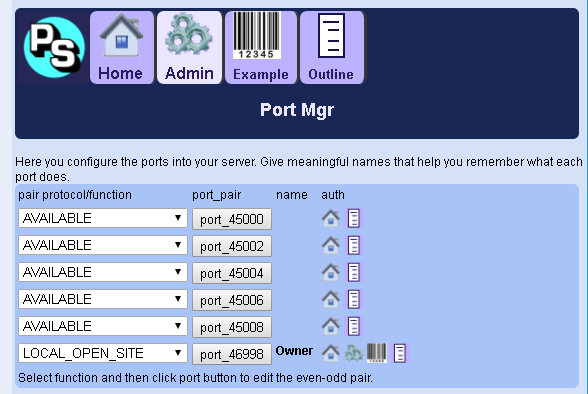 At right, we are looking at the default Owner view of the ports via the Port Mgr app. Each port has a list of apps which it supports, here shown as icons under the auth column. Notice in the top icons, that "Admin" has a lighter button background than the others. The Port Mgr is under the Admin menu. Looking again at the "auth" column, only the Owner row shows the Admin "gears" icon. In this way, the port orientation permits giving different (or same) access to different users of your server.